We are so excited to share this update with you! HONEY CAN SEE! 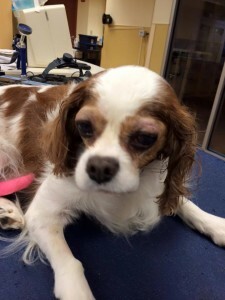 Honey, the sweet blenheim with severe cataracts, came to the Cavalier Alliance several weeks ago. She struggled with pneumonia, severe dental disease, and was basically frozen in place due to her blindness. Her cataracts were almost 1/2" thick. 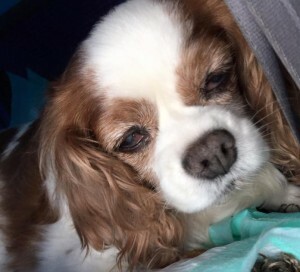 In this early photo you can see the cataracts on her eyes: And just look at the post-surgical difference: And the best part of all? After two days of hospitalization, she returns to her foster home and sees her four-legged buddies for the very first time. Her tail hasn't stopped wagging! Click on the line below to see the short video: Honey Sees Her Buddies Many many thanks to Deb Glottman, Honey's foster mom, the amazing team at Vermont Veterinary Eye Care including surgeon Sarah Stone Hoy and techs Angi and Ashlie, and all all of our wonderful supporters and donors who made sight possible for this deserving Cavalier.